Sports medicine specializes in preventing, diagnosing and treating injuries related to participating in sports and or exercise, specifically the rotation or deformation of joints or muscles caused by engaging in such physical activities. Most commonly associated with injuries sustained by athletes, sports medicine also extends to the active adult who participates in sports such as golf, tennis, running, swimming, surfing and other activities. Our Sports Medicine team is comprised of sub-specialty and fellowship trained orthopaedic surgeons, including James Grimes, MD, Albert Volk, MD, Kurtis Hort, MD, and Sina Kasraeian, MD, as well as Casey McClone, MD, a fellowship trained primary care sports medicine physician. Also included are licensed physical therapists and certified athletic trainers, making our Sports Medicine Center one of the most complete in the area – servicing Jacksonville, Saint Augustine and Palm Coast. We are able to provide thorough evaluation, accurate diagnosis, the most effective treatment recommendations, expert surgical intervention, and full rehabilitation programs. Treatment options vary with the extent of the injury. We take painstaking efforts to exhaust all conservative measures prior to surgical intervention for the injured athlete. When surgery is warranted, we take pride in offering the most highly advanced techniques available. The orthopaedic surgeons at Orthopaedic Associates of St. Augustine are board certified and fellowship trained with extensive experience in restoring injured athletes to their pre-injury level of performance. 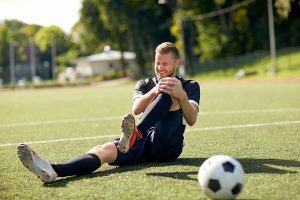 As a service to the community, our Sports Medicine Team currently provides medical coverage for St. Joseph’s Academy High School, Pedro Menendez High School, Florida Elite Soccer Academy, Ancient City Soccer League, and other municipal sports leagues.